Newsweek has just published a profile on a reclusive politically-libertarian physicist, Dorian Prentice Satoshi Nakamoto, who may be the "Satoshi Nakamoto" who created Bitcoin. The article lists a place and month/year of birth, without a date. Normally this is nowhere near enough information to tell us much about the native. In this case, however, we have enough data to establish a libertarian "whistleblower" chart. 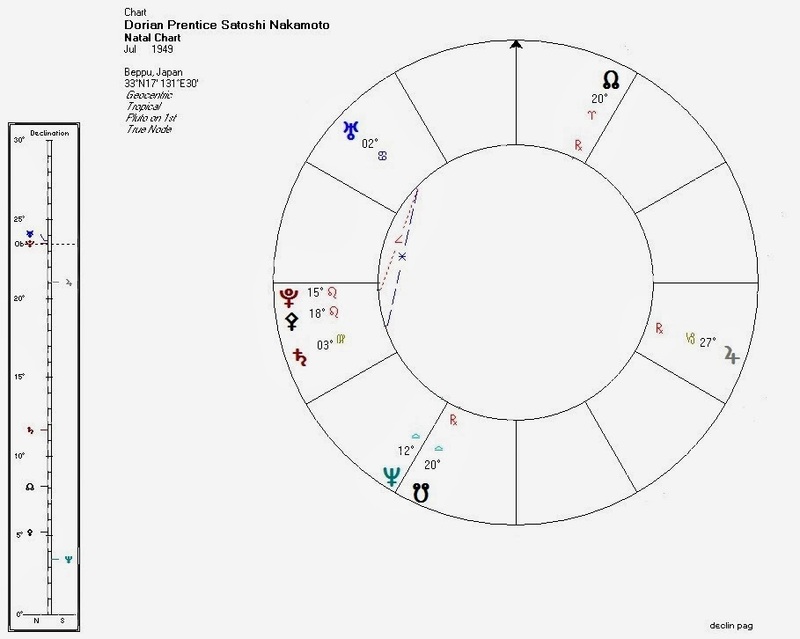 Nakamoto's Pallas would in any case be conjunct Pluto, establishing a willingness (at least in youth) towards the use of force which is consistent with a long career of government-affiliated work in classified research. Also in any case, Pallas would be trine the North Node. Even with the Pluto conjunction, the North Node sometimes affects Pallas disproportionately: here we get the probable libertarian streak which generally starts weak early in life and increases over time. The Saturn-Uranus sextile suggests a potential capacity for harnessing and creating structure (Saturn) out of innovation/technology (Uranus). The Uranus-Pluto semisquare/parallel suggests a generational rebellious streak -- but Pallas is a better indicator of rebellion on ethical/moral grounds rather than acting out for its own sake. Of course, all of these aspects will be present in the charts of anyone born in July of 1949. Nakamoto just appears to have made unusually good and striking use of them (assuming he is the creator of Bitcoin). Dorian Prentice Satoshi Nakamoto publicly denies having created Bitcoin.